The money frog is a money magnet with a large coin in its mouth. Display one in your home or business to protect and expand your wealth. Use feng shui tips to decide on the best placement for this iconic money symbol. The funny figures are shaped a bit like a money pouch, with a bulbous head, round belly and that tail-like leg in the back. 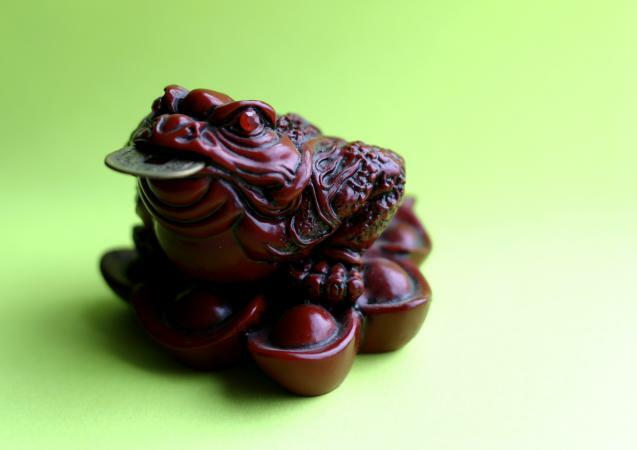 Typically, the frog sits on a gold ingot, a bed of coins, or an eight-sided feng shui bagua. Sometimes strings of coins trail from its mouth, which is always open wide enough to accept a coin. If your frog doesn't have a coin in its mouth, buy one and place it in there with the fake ruby side or the coin calligraphy side up. 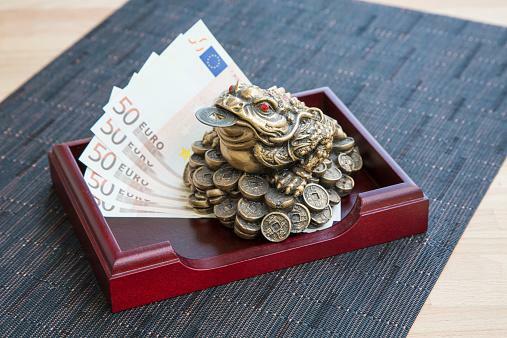 The money frog can be brass, gold, bronze, jade, resin or wood. It squats by your door or in a corner, and has only three legs. The money frog, three-legged toad, three-legged frog, or Ch'an Chu, will bring prosperity to your home or business when in the right position. If you face it away from where you want abundance to flow, money energy will spew right out the door. At home, place a single frog diagonal to the front door, facing inward so the money energy comes in, not out. You may also put a money frog in the Southeast corner of the home -- the wealth corner. In a business, position the frog diagonal to the main door, near the cash register, facing the cash register or the interior of the space. This "brings in" the money from the outside world. How Many Feng Shui Money Frogs Are Best? Put multiples of three frogs in your home. The number three stands for the harmony of earth, heaven, and humans; six accesses the luck of heaven; and number nine means greatness (of power and abundance) and eternity. In a business setting, don't put the frog directly on the ground but don't place it higher than the pockets of those entering the business. Money doesn't fall "up." In the home, don't put a money frog in a bedroom, bathroom or kitchen. The odd little part-tadpole figure comes with a few legends to explain its unusual appearance and power. Elixir of Immortality - Chang Ngo was a greedy wife who stole the Elixir of Immortality from her husband. The goddess who had bestowed the elixir turned her into a three-legged frog and banished her to the moon. Alternative elixir story - Another version of this tale has Chang Ngo transformed to a frog who is hunted by her furious husband and shot with an arrow in one leg, leaving her with three legs. Swallow the moon - Ch'an Chu is said to live on the moon and swallows the shiny coin-shaped orb periodically, causing a lunar eclipse. During the full moon, money frogs are believed to appear at the house or business of someone who will soon receive great wealth. Sticky stuff - The frog, or toad, is known to be so greedy that, as it travels around the heavens, money sticks to it. When it returns home, it brings lots of money with it -- and wealth to you. Liu Hai's fishing expedition - Liu Hai, one of the eight Immortals, decided to capture the money frog. He threaded a string of coins with red fishing line and used it to bait the frog. Try a money frog or add to a collection from these online merchants. 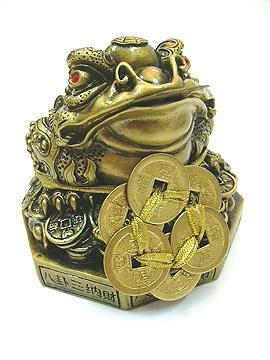 Feng Shui Import sells a brass frog atop feng shui coins for wealth luck. Red crystals adorn its back. It costs around $40. Feng Shui BestBuy offers a frog with six coins sitting on a bagua. Expect to spend about $30 for this gold chrome frog. 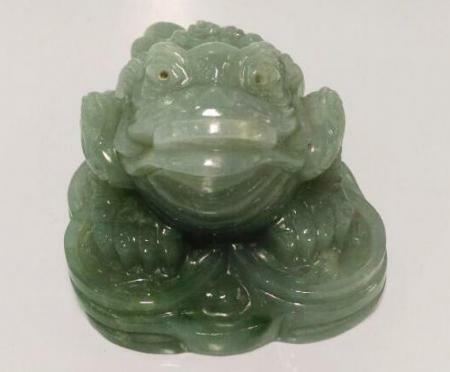 Land of Jade has a certified natural imperial jade money frog, carved of jadeite from Myanmar, for about $3,000. Display it in a locked case. Your money frog may be the cutest thing around but refrain from a heavy-handed display. If your guests or customers are uncomfortably aware of a looming money frog, that vibe will cancel out the free-flowing prosperity energy. When you do set out your wealth-attracting frog, be sure to enliven it by placing it on a piece of red paper or tying a red ribbon around it for good fortune and lasting prosperity.